There’s still time to meet our Raise the Roof Giving Opportunity! We urgently need your help. Habitat is challenging you and other loyal supporters to give what you can by September 30 to help us meet our $4,000 fundraising goal. Your gift helps single mothers like Susan. Having a single income can create problems for families that can’t afford a home of their own. 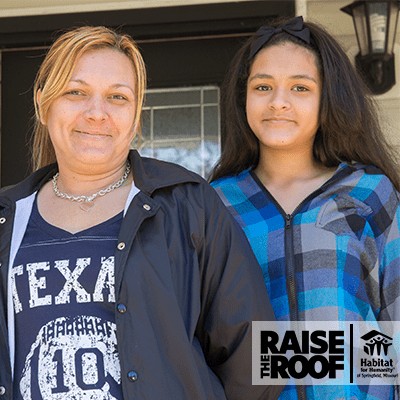 Habitat’s homebuying program brings together volunteers to help build safe homes that are then purchased with a 20-year, 0% interest mortgage for single mothers like Susan. Susan has put in hundreds of hours of volunteer time to support her community. As a single mother, she was pleased to partner with Habitat to have volunteers build a home for her two daughters. Thanks to supporters like you, we can make a difference for these families who have sacrificed so much. Please give a gift to our Raise the Roof Giving Opportunity today to help us make MORE of a difference for people in need of a safe home – like Susan. P.S. Time is running out to meet this Raise the Roof Giving Opportunity by September 30. You’ll help us do more for families working to create a safe, stable home. Please give your gift today!